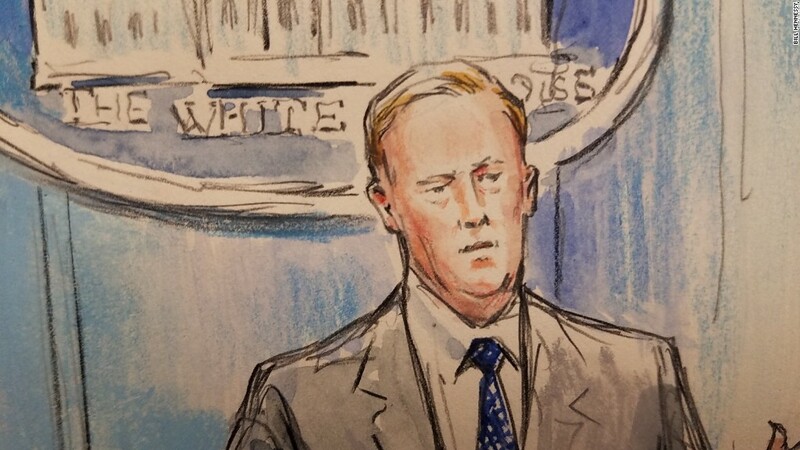 The White House has been prohibiting cameras at some press briefings, so on Friday CNN got creative and sent a sketch artist. 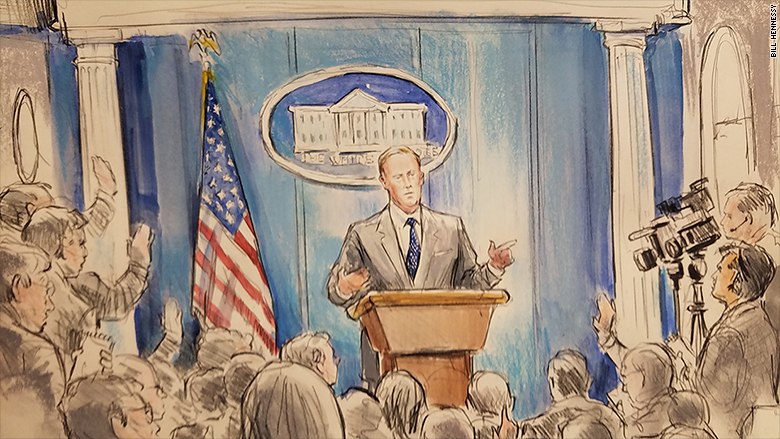 Bill Hennessy, the network's regular sketch artist for Supreme Court proceedings, headed over to the White House on Friday afternoon and drew Press Secretary Sean Spicer's afternoon briefing. He didn't have his usual easel, but he stood in the back of the briefing room to document the scene. Hennessy's sketches aren't exclusive to CNN; other news outlets may also use them. 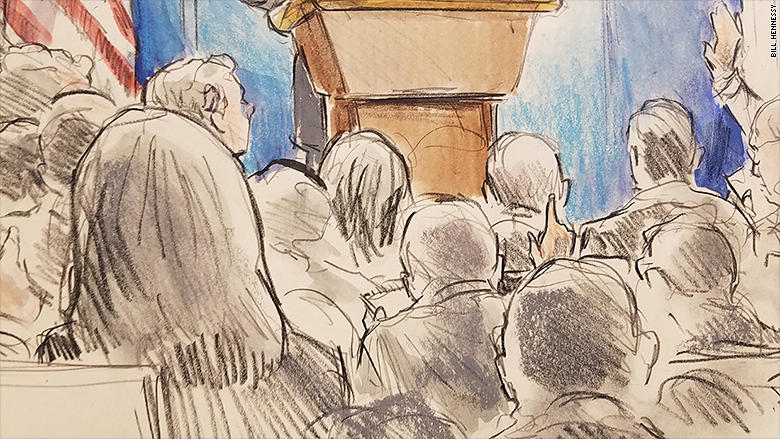 Some conservative media voices dismissed it as a stunt, but CNN argued that the sketch session did serve a journalistic purpose, in the same way that courtroom sketches do. CNN equated the briefing to a Supreme Court argument -- an on-the-record event at which cameras are banned. Sketches are also common in courtroom trials. The idea is to paint a picture for viewers who couldn't be in the room. The video camera that can be seen on the right side of some of Hennessy's sketches was turned off during the Friday briefing. It was one of several pieces of video equipment that remained in the briefing room at their normal locations, even as recording was banned. Hennessy has been a Washington-based courtroom sketch artist for decades. He has covered a wide range of cases, including the Clinton impeachment proceedings, terror suspect trials, and Guantanamo Bay detainee hearings. He worked for CNN at the Supreme Court on Thursday. Press secretaries for Democratic and Republican presidents have held on-camera briefings on a regular basis for the past quarter century. But the Trump White House has been cutting back on the frequency and the length of on-camera briefings. Spicer and his deputy Sarah Huckabee Sanders have only held four on-camera briefings in June. Most of their Q&A sessions have been held off-camera. The White House has also prohibited live audio broadcasts of the briefing. On Thursday and Friday, CNN aired the briefing audio in its entirety shortly after it ended. Spicer was asked on Friday afternoon about the rollback in access. "Some days we'll do it" on camera, he said. "I think it's great for us to come out here and have a substantive discussion about policies. I don't think that the be all and end all is whether it's on television or not."